After gathering more than two million people in demonstrations in 500 cities during the month of June, Brazil is experiencing a new phase of mobilization. The national day struggles on July 11 represented the first action of the organized working class movement in this process of struggle. This time, more important than the street demonstrations, what marked this national day of struggle called by unions were the actions to paralyze production and the movement of goods and services. According to official data, 66 federal highways were blocked in all regions of the country. Workers in industry, trade and services also conducted strikes in many regions. Production was paralyzed in the whole car production industry and in various car parts factories in the ABC region (metropolitan area of São Paulo), many plants of the metallurgical sector in the city of São Paulo and in the metallurgical, chemical, oil and power industries in the Paraíba Valley (highly industrialized region in the state of São Paulo). Auto workers from other states, such as Minas Gerais and Rio Grande do Sul, also paralyzed production. Civil construction workers in Belém, Fortaleza and São Paulo also stopped construction sites. The strike organized by the public transport workers in big cities like Porto Alegre and Belo Horizonte affected other economic activities. Several categories of public sector workers also conducted strikes. The national day of struggle was called by eight trade unions federations, including the CUT (historically linked to the PT), the Force Sindical (traditionally class collaborationist), but also the CSP-Conlutas, an organization headed by the socialist left. In addition to the trade unions, the Movement of Landless Rural Workers (MST) was also one of the conveners of the mobilization. Included in the demands of the day of struggle were: the reduction of transport tariffs and improved quality of transport, more investment in health and education, an increase in pensions, reduction of working hours, the end of the selling off of oil reserves, against the bill that promotes outsourcing and finally, the defense of agrarian reform. The union bureaucracy of the pro-government federations was pushed into action by the massive mobilizations of June. Inaction would make them lose even more authority and representation among their bases and among the millions who mobilized. The national day of struggle was not organized democratically and from below in most sectors. For much of the union leadership, entering the scene of the struggle also means trying to control the movement and prevent it from grow to the point of putting the government under threat. Still, July 11 played a positive role for the continuity of the struggle. Despite the union leadership, it represented a key step in the entry of the organized working class into the struggle with the methods of strikes, work stoppages and roadblocks. With the exception of CSP-Conlutas, the trade union federations refused to accept the proposal to build a real general strike of 24 hours. Still, they have given a deadline for the government to respond to their demands and planned a new national day of struggle for August 30. In addition, many categories of workers will start their campaigns in the coming months for wage increases and other specific claims. This scenario, along with the pressure organized by the base, may end up pushing the federations to call a general strike. The events of July 11 occurred shortly after the social explosion during the month of June. The ‘June days’ started around the fight for reduced tariffs for public transport. The harsh police repression of the movement sparked massive outrage and widespread solidarity. The holding of the Confederations’ Cup in Brazil in this period also stimulated the anger that was reflected on the streets across the country. The contrast between the precariousness of public health and education, and transport, and the spending of billions on the preparation of the World Cup in 2014 and the Olympics in Rio in 2016, provoked the anger that was demonstrated in the streets. State and local governments were forced to change policy and revoke tariff increases on transport. Instead of holding back further demonstrations, this victory only urged on the mass movement. 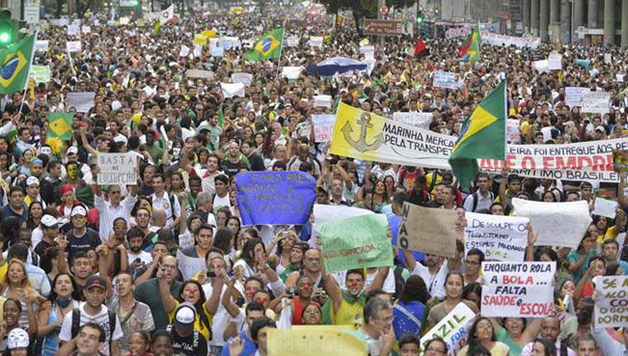 The day after the withdrawal of the increase in Sao Paulo and Rio on June 19, the country saw an explosion of demonstrations in some cities, assuming characteristics of a true popular uprising, terrorizing governments and the ruling class. In cities such as Brasilia, Rio de Janeiro, Belo Horizonte, Salvador, etc., there was a strong police repression which only served to radicalize the movement, including occupations of Municipalities and State Legislative Assemblies. Many games of the Confederations Cup had more people protesting outside the stadium than fans inside. For several days, almost daily demonstrations exploded everywhere without a clear leadership and raising a wide variety of demands. In this scenario, many diverse political forces sought to dispute the leadership of the demonstrations. Sectors on the right tried to manipulate the broad sentiment against the political parties and the political system in general to stigmatize the socialist left in the demonstrations and impose an agenda, centered on the theme of corruption of the government of Dilma Rousseff’s PT. On the other hand, sectors of the PT, terrified by the mass movement and the potential damage its government would suffer, tried to create the impression that the right was using the demonstrations to promote some kind of coup. They tried to neutralize the left opposition to the government, luring them into a political front against the right. The contradictions present in the consciousness of the masses who took to the streets are largely the result of the historic betrayal by the PT. Unlike the mass movements in Brazil in the 1980s and early 1990s, this time there is no strong mass political reference on the left. Both during the mass campaign for direct presidential elections in 1984, which brought millions onto the streets, as well as during the movement which culminated in the overthrow of President Collor in 1992, the PT and the CUT were seen as a clear alternative on the left by the working class. With the full incorporation of the PT in the political and economic game of capitalism, the generation that makes up the current mobilizations does not have the same left wing and class references, and often ends up identifying “the left” with the parties that are in government. The slowness and limitations of the process of re-building a mass socialist left in Brazil, which included the formation of PSOL, ended up being another factor that allowed the emergence of these contradictions in the consciousness of some sectors of the masses. Despite this, the mass movement that exploded in Brazil in June represents a qualitative change in the situation of the country. The feeling of power that is created by collective struggle is present in the consciousness of millions of young people, students and workers. A willingness for the direct struggle, to occupy the streets, to strike and protest, is now far more prevalent among sectors of the masses. In only a few weeks, the contradictions of more than two decades of neoliberalism, including ten years of management Lula / PT of Brazilian capitalism, exploded onto the surface. These events have changed the balance of forces between the classes in the country. While the capitalist class maintains its position of strength, in defense of their interests, the institutions of the political regime were forced to make concessions to contain the movement. Besides the reduction in transport fares, other rate increases were canceled such as those of privatised highway tolls in São Paulo. Demands of social movements over years which had received no response from governments were suddenly just accepted out of the blue, as in the case of the increased “stock-rents” given to homeless workers on the outskirts of São Paulo. To try to calm popular anger against the political system, for the first time since the 1988 Constitution, the Supreme Court granted leave for a convicted MP could actually be jailed. President Dilma Rousseff tried to demonstrate that she was not against the mass movement, and organized a media show where she received leaders of social movements and trade unions. From the beginning both the PT and the PSDB, which polarize the political scene, acted together in raising transport fares, promoting repression of movements and then retreating in a coordinated way before the power of the streets. Today, the entire political system is experiencing huge uncertainty. The rate of support for governments has tumbled in most cases. Dilma, who has always enjoyed the highest rates of support in the polls, has lost 27% in support since the beginning of the demonstrations. The governor of São Paulo, Geraldo Alckmin (PSDB) had lost 14% (52% before the protests to 38%). After less than six months in the city government, support for the mayor of São Paulo, Fernando Haddad (PT), has decreased by 16% positive ratings. Similar falls also hit the governor of Rio de Janeiro, Sergio Cabral (PMDB, ally of Rousseff) and the mayor of Rio, Eduardo Paes (PMDB). federal government has also increased conflictivity within the National Congress despite the big majority enjoyed by pro-government parties. While polls show growing numbers intending to vote blank or abstain, candidates seen as “outsiders” as is the case of Marina Silva (former Green Party who has organised her own party) have seen some growth in support. The current president of the Supreme Court, Joaquim Barbosa, appears well regarded in the polls despite not being a candidate and not affiliated with any party. The possibility that he stands in elections is not the most likely, but cannot be ruled out if the crisis situation worsens, and the ruling class stops relying on the ability of PT to contain the mass movement. Within the PT, a sector has begun to defend the possibility that Lula stand as presidential candidate, in place of Dilma. This hypothesis would be feasible only in a context of profound crisis. Lula has much more strength to contain the union leaders and more authority to appeal to broad sections of the masses. Strategically, Lula has disappeared from the political scene and has been confined to the backstage. He tries his best to avoid his authority and prestige being undermined by popular movements. At the height of the demonstrations, Dilma left a situation of paralysis and amazement and tried to take some political initiatives. In an official statement, she talked about the need for a new “social pact” around a vague agenda of topics and announced the need for political reform in the country, through a Constituent Assembly, exclusively for this purpose. She also made sure to include fiscal responsibility, concern for public expenditure and the payment of the public debt, as part of such a covenant. The proposal for a Constituent Assembly did not last 24 hours before the government quickly shifted. She went on to defend the holding of a referendum on political reform before the 2014 elections. But this proposal also sunk, due to the lack of support in Congress. When talking about political reform and a referendum, Dilma tries to channel popular discontent through institutionalist channels. She wants to get the workers and youth off of the streets, where they raise their banners of struggle and to confine political action to the polls in a referendum where the agenda for discussion is imposed by the government. No proposal for radical change in the political system was placed on the table for discussion. What Dilma wants is a reform of the electoral system that benefits the government as well as measures that reduce the dependence of the government on an unstable majority in Congress that always demands more in terms of positions and privileges in return for supporting the government. The political crisis is fueled by the increasingly clear signs of difficulties in the economy. The government of Dilma Rousseff is hit by low economic growth. In 2012, Brazil’s GDP grew only 0.9%. Estimates of higher growth in 2013 are already being revised to around 2.5%, but there are those who point to the prospect of GDP growing less than 2% despite all the measures taken in the previous period to stimulate the economy. Along with low growth, high inflation in the previous period, mainly affecting the poorest people, was one of the factors that stimulated the outburst in June. To curb inflation, the Brazilian Central Bank resumed its policy of high interest rates which should further affect growth and also complicates the government’s fiscal position. The Brazilian bourgeoisie is very concerned about the “price” it will have to pay for these mass mobilizations. They fear that concessions made the streets will unbalance the situation further and worsen the fiscal and economic outlook. The government’s rhetoric about “fiscal responsibility” shows its overrriding commitment to the payment of the public debt and interest than. Last year, for example, it destined 44% of the federal budget to this end, while health spending accounted for 4.17 % and education 3.34%. About 80% of the Brazilian public debt is under control of a select group of 20,000 investors. An audit, controlled by workers, and non-payment of such debt to the big capitalist speculators would create a source of funds for a revolution in education, health, transport and housing. The mass mobilizations of June in conjunction with the action of the organized labor movement on 11 July point to a completely new situation in Brazil. Since the final integration of the PT into the bourgeois state with the beginning of the Lula government in 2003, the socialist left sought to reorganize in preparation for future fights. When these struggles came, the socialist left showed that it was not fully abrest of the situation. A part of the left took a sectarian position before the mass movement. This sector echoed the rhetoric about the right manipulating the masses and adopted a deeply pessimistic tone. For some of them, sectarianism towards the masses was complemented by the capitulation towards the government. Most of the leadership of PSOL in previous years has adopted a policy of prioritizing the electoral contest, using the argument that there was a downturn in mass struggles. This policy has led the party leadership to advocate electoral coalitions with the PT and other governing parties. This attitude did not help PSOL to intervene in mass struggles. With a Congress scheduled for the end of the year, the rise of the struggles is already affecting the party internally. There is room for the left of the party to grow, against the opportunistic electoralist positions of the majority sector. An example of the wearing out of the right wing of the party was the rejection of the position adopted by the Randolfe Rodrigues, the nominee for Presidential candidate supported by the right wing of PSOL. He was received by Dilma Rousseff, despite the party leadership rejecting the invitation of the President. Randolfe was keen to meet with Dilma even against the will of the party. The left of PSOL is discussing a united challenge for the race for PSOL presidential candidate in opposition to Randolfe Rodrigues. A part of the left has raised the name of the former MP, Luciana Genro. Another sector proposes current MP, Chico Alencar, who despite not being on the left of the party and aligned more with the policies of the majority leadership, is seen as more open and democratic. LSR (CWI in Brazil) argues first of all for the building a democratic socialist political platform to be defended in Congress of the party. As for the presidential nomination, without entering into a discussion of names, we argue that the Left Party have a united candidate around such a platform and that opposes the right wing of the PSOL. The backdrop of the rise of the struggles can only help PSOL, from the point of view of its internal debates, its social integration among workers, youth and their struggles, beyond a mere electoral intervention. The party grew electorally in the municipal elections of 2012, but also made serious mistakes that risk everything, such as the alliances with the PT and other governing parties. ZERO fares for public transport! Nationalization of the transport system under democratic control of workers and users! No cuts in social spending and investments! More investment in the quality of transport and utilities! Public money for health and education and not for stadiums for the World Cup! 10% of GDP for education now! 10% for the health budget now! Ensure the necessary resources through the suspension of payment of municipal debt to the federal government that only benefits a handful of speculators! For an audit, controlled by workers’ organisations and the non-payment of domestic and foreign debt to the big capitalists! Not to removals! Housing rights guaranteed to all! No to emergency laws for the Cup! For the democratic right to demonstrate! No to the criminalization of social movements and repression! Freedom and an end to the prosecution of protesters! Enough of racist police violence in the suburbs! Demilitarization of the police! For wage increases in line with inflation! Freeze food prices and utility tariffs! Reduction of working hours without reducing wages! Abolish the pensions reform! In addition to these points, our program must defend a united front of the left and the workers, with a socialist program as a way to build a political left, socialist, democratic alternative to Lulism and the traditional right. We need to create the conditions for the establishment of a real workers’ government. The LSR has worked in the front line of the demonstrations in various regions of the country together with the youth and workers. The new situation has opened up good prospects of growth for our organization. In addition to college students and young workers who are now entering the political struggle, there is the potential to win new members among sectors of activists who seek to build a consequent left alternative in this new historical stage of the class struggle in Brazil. An example is a group of metallurgical union leaders in Minas Gerais who have just joined LSR. Other examples of this type must be repeated in the next period. Previous articleLow-Wage Workers Fighting Back!